NEW YORK (WABC) -- There's a group of runners who rarely get noticed, but their perseverance and need for recognition may be greater than any other. These are the final finishers -- they cross the finish line hours after most other runners. Their stories often include struggles that go beyond the race, and for many of them getting the medal is a lifelong goal. But the track is tougher for them, too. At some point during their journeys, roads are no longer blocked off to traffic and water stations are unmanned and empty (and likely already packed up). One runner said she had to stop at a bodega to get water. This bunch runs for a reason, and they don't let defeat overcome their thoughts and stop their bodies from carrying them through the marathon. 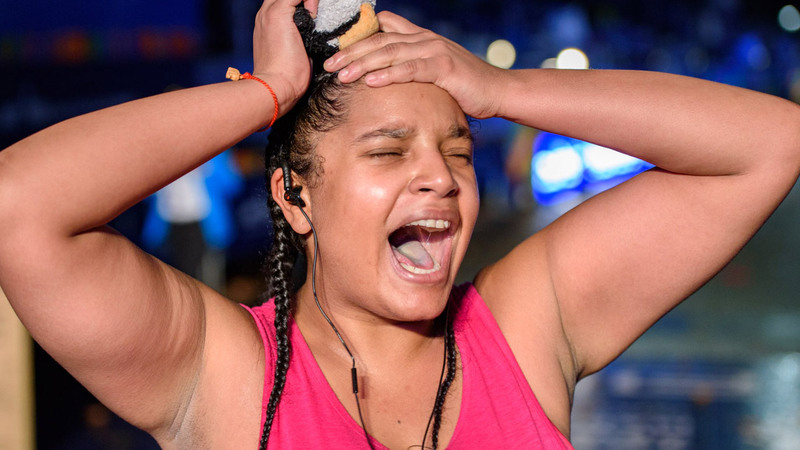 We wanted to showcase these runners' stories, so we headed to the TCS New York City Marathon finish line after 7 p.m. Sunday -- at a time when most people are going the other way. The participants still going at this point were at eight hours or more into the 26.2-mile course through all five NYC boroughs, and the crowd is thin. We captured a series of photos of a dozen runners from the point they first approached the finish area in Central Park until they crossed the finish line (swipe through each gallery to see the progression to the finish line). The emotion they showed after getting the medal is moving. Check out their stories, including full-length audio interviews below. * Did you have any point when you wanted to give up? "Yeah, when I entered Manhattan. Mile 18." * Going across the bridge the bridge was pretty rough, right? "It hurt bad. But I made it. I can't believe I made it." "Last year I started the race, I had a couple of injuries. I ended up dropping out after mile 16. Felt a little bit this year, healed some of my injuries and came back for a little bit of redemption. I'm also running, unfortunately, this year I lost my father-in-law and my grandmother-in-law. I'm running in their memory today." "I've lost 170 pounds, and a friend conned me into doing this with her. She already finished." "I bought the finisher shirt, so I didn't want to return it. I've worked so hard for this that I just wanted to complete it." "I feel like crying. I hurt my knee. Mile 16." What made you want to keep going on? "I didn't. I stopped and cried for about 25 minutes. And then I called my fiancee to come help me but she couldn't find me because New York is confusing." America Styles -- Washington, D.C.
"I was running because I didn't think I could do it. This is my fifth marathon of the year. I've been working with Rock 'n' Roll Marathon to practice for this. This is the first one that I've done completely by myself. Every freaking step, and it's amazing. Woo! I'm a turtle but I finished." "I was running to raise money for a charity in Tunisia to build a brand new well there. Their well is dry. And just as a personal challenge. So it's an extraordinary city, as you know already, and I'm just very pleased to be a part of it." How did it feel to cross the finish line? "I made it. Thank you for staying up and waiting for me." At any point did you want to give up? "My body did, my heart at no point wanted to give up. I felt that with the wonderful support of all of the New Yorkers, the workers, the FDNY, the NYPD - that I could definitely do it. "I hurt my knee a while ago, but it was OK starting out today and I thought I could do it. I'm so glad one of the medical tents had crutches from me. Otherwise, I'd be quitting. I'm an old nurse, so you know, we can't give up." "It's my bucket list out of New York City, and I've lived here for almost 30 years. I've wanted to see this, I've wanted to experience this first hand. When I was a senior at NYU, I was in a photojournalism class and we photographed this. I said 'one day I'm going to be here' - 26 years ago." "I didn't want to give up. Even through the pain, I didn't want to give up." "I did it for my own reasons, for personal reasons. I did it for my health. I initially started for that reason, and this was on my bucket list. Sorry that I'm like a mess right now, but I can't believe I finished. I didn't break down the whole course until just now. I can't believe I finished. I never thought I could." "Even at like 400 meters, I was ready to call it quits. But the fans, the people who are still out here at this hour cheering people on, that really helped." "I'm turning 76 next week, and this is my birthday present." Did you feel like giving up? "I thought that when I cramped up really badly, I ran out of hotshot, but I was able to kind of work through it, so that was great." "I just kept thinking about my family. I was on the fence about doing it, because I injured my knees. And then I decided to walk the marathon. At one point, when the buses came by - they pick people up - to be honest, I had a thought, should I just give up? And I said no. I'm just going to keep doing it." "This is my third attempt for the marathon. I wasn't able to complete it in 2015 or last year. Amazing. It's overwhelming."